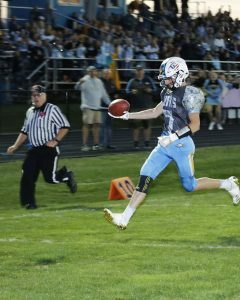 Concluding a week full of exciting activities and Lynnville-Sully fans flashing their school spirit, the Hawk football team capped it off with a win against the Pekin Panthers. L-S dominated the Panthers 35-7 on Friday, Sept. 29, in a much-awaited battle. Both teams were undefeated coming into the game; the Panthers were 6-0 and ranked No. 6 in Class A while the Hawks were 5-0 and ranked No. 9. L-S Coach Mike Parkinson was pleased with the way his team came together to take down Pekin. 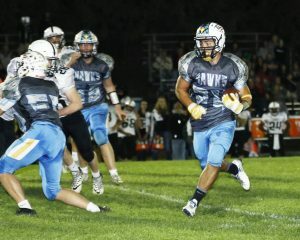 The Hawks’ leading rusher on Friday, junior Nate Stock, carries the ball for L-S. He finished the night with 101 yards on six carries. “We went into this game maybe a little uncertain of our potential, but now we have seen a glimpse of what we can do as one,” he said. L-S came out strong right from the beginning with junior Gage Vander Leest returning the kickoff for 40 yards, earning the Hawks solid field position. They put their first points on the board in just nine plays with senior Elijah Collins hitting junior Tyson Vander Linden in stride for a 14-yard touchdown pass. The PAT kick by senior Brevin Hansen was good. Less than a minute later, Pekin responded with a 60-yard run for their only touchdown of the night. The scoreboard read 7-7. On third and 8 with a little over three minutes left in the first quarter, Collins connected with classmate Sage Zylstra for a 92-yard touchdown pass. The kick was no good, but the Hawks went into the second quarter on top, 13-7. Junior Tyson Vander Linden crosses into the end zone after catching a pass from senior Elijah Collins in the game against Pekin on Friday. Collins finished up a 98-yard drive by running the ball in for L-S’s third touchdown of the night. The PAT by Hansen was successful. The Hawks kept rolling, scoring once more before the half ended. Junior Evan Squires reached the end zone on a two-yard run and also ran the ball in on the following two-point conversion. Defense continued to play solid, ending the half by blocking a field goal, with the score reading 28-7. The Hawks scored one more time in the game. With 6:38 left in the third, junior Nate Stock went on a 77-yard run for a touchdown. The PAT by Hansen was good. L-S played lights-out defense for the rest of the game and walked away victorious 35-7. Coach Parkinson said he can’t emphasize enough how proud he and the coaching staff are of the Hawks. Collins finished the night throwing for 187 yards in seven completions of 17 throws. Stock led the night in rushing with 101 yards on six carries. Behind him was Zylstra in eight carries running for 73 yards, Zylstra also led receiving yards with his 92-yard reception. Vander Linden had three receptions for 56 yards. Defense had a phenomenal game as well, and senior Carson Dunsbergen led the team in tackles with nine. Both Vander Leest and Stock came away with seven tackles. The Hawks racked up four tackles for losses and one quarterback sack. L-S (6-0) travels to New London on Friday, Oct. 6. New London (5-0) has beaten conference opponents Montezuma and North Mahaska, as well as Cardinal, 63-12.